Extreme Makeover: Recipe Edition | What Smells So Good? Mmm, chocolate. Who doesn't love it, at least every now and then? 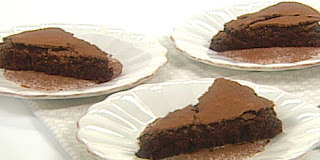 The quintessential chocolate dessert out there would have to be the flourless cake. Descriptions for this rich, eggy fudge dessert range from "the source of many fantasies — and yes, even delirium" (Nathalie Dupree) to "a rich dessert with a soul of pure decadence" (Chesapeake Bay). Mos t recipes include at least 12 oz of fine chocolate, a whack of butter and at least 5 eggs, so thankfully they are served in thin slivers, usually alongside a cup of strong coffee or fortified wine. Now, to make things interesting, I thought I would take this seemingly diet-disasterous dessert and attempt at least to make it a bit better for our consciences without sacrificing the richness or decadence of the original. On top of that, I was interested in seeing if I could make a dessert that could be enjoyed by pretty much everyone at a holiday or New Years party (seeing as it's coming into that time of year again!). That would mean taking into account allergies to wheat and gluten, dairy, and eggs, as well as at least thinking about the sugar levels (seeing as the stepfather and my grandfather are both diabetic!) while concocting this. Luckily, I've had a bit of experience playing with egg substitutes in various applications so I had a starting point, from which I tweaked, poked and prodded the French delicacy into a heavily modified (purists would say bastardized) decadent dessert that is, well, shall we say, a wee bit on the Eastern side of the planet! This is my starting point: a rich, espresso-infused blend of butter and chocolate, bound with a fine protein web of eggs. Delicious, the epitome of a romantic, decadent sweet, and guaranteed to go over well with any group of chocoholics (or women, but some would say they're the same thing). Preheat oven to 350F; line bottom of 9" spring-form pan with non-stick foil or parchment paper, and wrap outside of pan with a layer of heavy-duty aluminium foil. Place chocolate in large bowl; set aside. In medium saucepan bring butter, sugar, and espresso to a boil, stirring to dissolve sugar; once melted and blended, add to chocolate, whisking until smooth; cool slightly. Lightly beat eggs together; whisk in some of chocolate mixture, then add egg mixture into remainder of chocolate mixture, whisking until smooth. Pour batter into spring-form pan, place pan in a large roasting pan, pouring enough hot water to come halfway up the sides of the pan. Bake for approximately one hour, or until a cake tester comes out with a few moist crumbs attached; remove cake from pan and chill overnight. And here's the re-modeled, vegan friendly edition of the cake I came up with. No eggs = no 136.8mg of cholesterol to worry about, and a drop in the margarine and sugar contributions = less calories (31%) and fat (38%)! Eight eggs was definitely a challenge to replace, but with the wonderful ingredients of tofu (and light tofu at that) and cornstarch to act as the missing binders and body of this wonderfully rich dessert, you would never be able to tell! As with the original recipe, small slices and good quality chocolate are the keys here. Come on, you didn't really think that you could eat the whole thing now, did you?? This ain't featherweight food here, this is serious, rich chocoholic bliss! Grease and line the bottom of a 9” spring-form pan with parchment, wrap in heavy-duty foil and set aside. In the top of a double boiler, combine the margarine, chocolate and coffee. Melt, stirring occasionally, until smooth. Remove from the heat and let cool for 5 minutes. In a blender or food processor, combine tofu, cornstarch, water and vanilla until smooth. Pour into a mixing bowl. Beat in sugar until well blended, then add chocolate mixture and combine thoroughly, taking care not to beat air into the batter. Pour the mixture into the prepared pan and rap sharply on the counter top 4-5 times to dissipate air bubbles. Bake for 1 hour in a prepared water bath, and cool completely in pan on a wire rack. 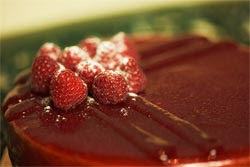 fabulous recipe makeover - the vegan torte sounds heavenly!